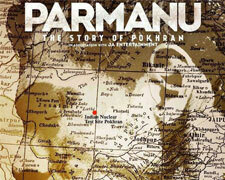 Parmanu film is based on nuclear test happened at Phokhran by Indian Army in 1998. John Abraham, Diana Penty and Boman Irani are playing the leading roles in the film. It will release on 25th May, 2018. The film is directed by Abhishek Sharma and produced by Zee Studios, JA Entertainment and KriArj Entertainment. EaseMyTrip has taken distribution rights of the film for Delhi, UP and Punjab regions.